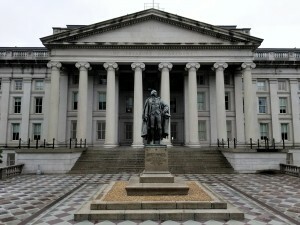 WASHINGTON - Finance ministers from several Latin American nations as well as the U.S. and Europe have agreed to work jointly to locate and seize the proceeds arising from corruption by Venezuelan government insiders, two U.S. Treasury officials said Thursday. The decision came at a Washington meeting earlier in the day attended by Treasury Secretary Steven Mnuchin at which the finance officials from 16 nations also discussed ways to provide swift economic and humanitarian assistance to Venezuela, including substantial debt relief, in the event socialist President Nicolas Maduro is replaced by a government they deem more legitimate and committed to economic reform. The two officials agreed to talk about the meeting only if not quoted by name because the discussions were to be private. Officials from France, Germany, Britain, Japan and all major Latin American nations participated in the meeting, which took place on the sidelines of the International Monetary Fund's spring meetings. The IMF this week forecast Venezuela's economy will shrink 15 percent in 2018, extending for a fifth year a recession that already surpassed in size the U.S. Great Depression. Inflation for the year is expected to soar to almost 14,000 percent. "Concrete actions are necessary to restrict the ability of corrupt Venezuelan officials and their support networks from abusing the international financial system," Mnuchin said in a statement after the meeting that provided few details on actions that were agreed on. The two officials said a joint presentation by Colombia and the U.S. described how top Venezuelan officials operating through front companies siphoned off as much as 70 percent of funding for Maduro's hallmark program to alleviate hunger through the use of no-bid contracts, overbilling and the resale at black-market prices of food boxes assembled in Mexico. The presentation mapped in detail one network run out of Hong Kong and involving 30 shell companies spread across four continents, the officials said. Maduro has consistently rejected U.S. offers of humanitarian assistance, considering them a veiled attempt to destabilize his rule. He also blames financial sanctions imposed by the Trump administration for forcing the government to fall behind on repayment of its bonds and exacerbating the country's economic woes. The officials said the goal in tracking graft in Venezuela is to seize and eventually return the stolen proceeds to the Venezuelan people in a post-Maduro scenario. They said the participants also agreed to prevent Venezuela's bankrupt government from liquidating at fire sale prices valuable overseas assets such as oil refineries and Houston-based petroleum company Citgo in a quest for fresh cash that would prolong the government's hold on power. In order to tighten the financial noose around Maduro and his allies, the U.S. officials said more countries must follow the lead of Panama, which recently blacklisted Maduro and dozens of top officials, considering them a "high risk" for money laundering. The move sparked a quickly escalating feud that led Venezuela to kick out dozens of Panamanian companies and Panama to withdraw its ambassador from Venezuela. "What Panama did was send a clear message that we want to protect our financial and logistics systems from illicit activities," said Panamanian Finance Minister Dulcidio De La Guardia, who also attended the meeting. Maduro is seeking re-election next month in a vote being boycotted by the opposition and which the U.S. and the European Union have condemned as a sham because several prominent government critics are banned from running. As Venezuela's economy continues to tailspin, the government and state-run oil giant PDVSA have fallen behind on their debt payments. But holders of their more than $60 billion in Venezuelan bonds have yet to sue, perhaps betting they stand a better chance of recovering value for the worthless paper if a more business-friendly government takes power. Any bailout of the oil-rich nation would require long-term international support and involve "sizable" debt relief, the two U.S. officials said. In contrast, they said, both private and public creditors that continue lending to Maduro risk having their loans disavowed because they lack approval from the opposition-controlled National Assembly, which the U.S. and others view as the last remaining democratic institution in Venezuela. "Looking forward, participants recognized that a government in Venezuela that warranted the support of the region, and was prepared to enact economic policies to reclaim Venezuela's prosperity for its people, would receive the support of the international financial community," Mnuchin's statement said. Separately on Thursday, the U.S. Justice Department announced that a top former executive at PDVSA pleaded guilty to helping hide millions of dollars in bribes paid to top oil officials by two Venezuelan businessmen in exchange for contracts and quick payment of outstanding invoices. Cesar Rincon, the former head of PDVSA's procurement subsidiary, was arrested in October in Spain along with four other former top Venezuelan officials. As part of his plea agreement, he was ordered by a federal judge in Houston to repay more than $7 million. U.S. prosecutors have so far secured guilty pleas from 11 individuals in connection to a widening probe into corruption at PDVSA that also has implicated former Oil Minister and PDVSA boss Rafael Ramirez, according to American officials familiar with the investigation.